The remains of Walter Skold are buried at a cemetery in Brunswick under a slate tombstone carved with a dancing skeleton at the top. BRUNSWICK — The founder of the Dead Poets Society of America got what he wanted Monday: His remains were laid to rest under a special tombstone he commissioned before suffering a fatal heart attack. 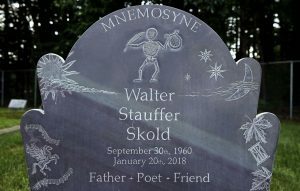 The family of Walter Skold read poetry, including some of his own works, during the ceremony in a historic cemetery in Brunswick. His remains were buried under a slate tombstone carved with a dancing skeleton at the top. Charles Skold, son of Walter Skold, embraces his mother, Barbara, at Pine Grove Cemetery in Brunswick on Monday. Family members read poetry, including some of Walter Skold’s own works, during the ceremony in the historic cemetery. Known as the “dead poet guy,” Skold combined humor, history and the macabre in his travels to the final resting places of more than 600 poets. 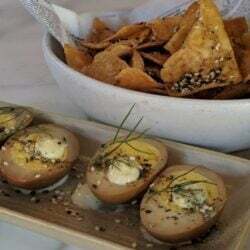 He launched the Dead Poets Society in 2008 in Maine, drawing inspiration for the name from the 1989 Robin Williams movie. 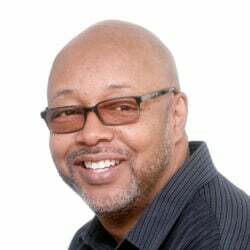 His ultimate goal, he said, was to draw attention to poetry and poets, especially those bards who were in danger of being forgotten by history. He traveled in a colorful cargo van dubbed “Dedgar the Poemobile” with a stuffed panther named “Raven” and an Edgar Allan Poe bobblehead on the dashboard. He held graveyard poetry readings and sometimes toasted poets with a drink. More than once, he had to explain himself to police. Tombstone of Walter Skold, founder of the Dead Poets Society of America, is topped by a quill and a dancing skeleton. That uniqueness came through in his tombstone, which he commissioned little more than a month before he was felled at age 57 in January by a heart attack. Michael Updike, son of novelist John Updike, was enlisted to carve the tombstone featuring a scattershot of literary inspiration from Skold’s life and from graves he’d visited. The tombstone was supposed to be at a family plot in York, Pennsylvania. But it was rejected because it didn’t meet the cemetery’s requirements. 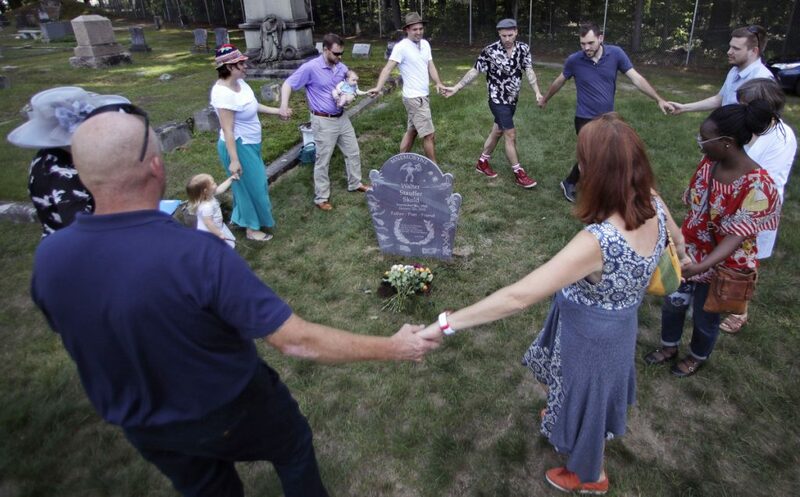 So the family decided to bury part of Skold’s ashes in Maine, where he lived when he created the Dead Poets Society of America and began documenting graves. Charles Skold said his father would have approved of his final resting place at Pine Grove Cemetery. Situated behind Bowdoin College, the historic cemetery is the final resting place of the late Civil War general and governor Joshua Chamberlain. The sun appears over the tree line at the gravesite of Walter Skold at Pine Grove Cemetery in Brunswick. 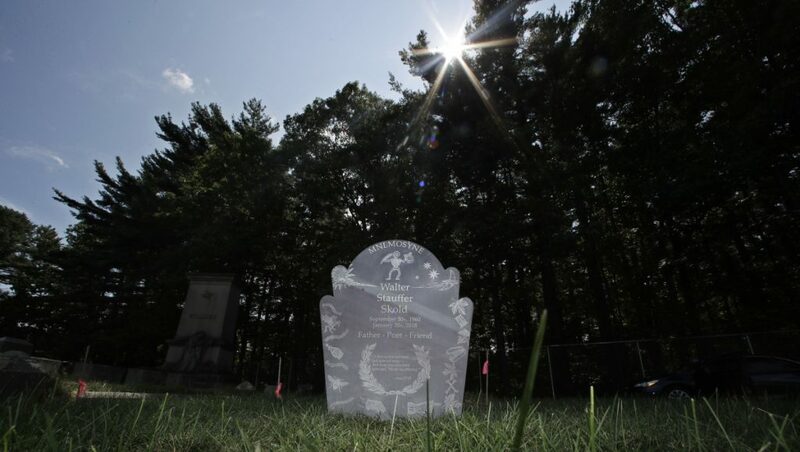 Skold enlisted the son of novelist John Updike to carve a unique grave marker.